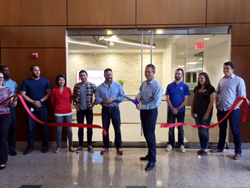 Personify President and CEO Eric Thurston celebrates the opening of Personify's newest office space in Austin, TX. Personify, the leading provider of enterprise software and service solutions to mission-driven and member-focused organizations, celebrated the expansion of its office space in Austin on Tuesday, May 24th. With the addition of the new workspace, Personify now has over 100 employees working out of the northwest Austin location. Personify opened its original Austin location in 2014, giving the software provider access to talented technical resources in the Austin area and easy access to Personify’s expanding customer base across the country. The Austin location now houses resources in client support, product development, professional services, finance, human resources and sales/marketing. Personify also has offices in Oak Brook, IL and Vienna, VA.